Extremadura, the land of "Conquistadores", is an autonomous community bordering Portugal and made up of the provinces of Cáceres and Badajoz. 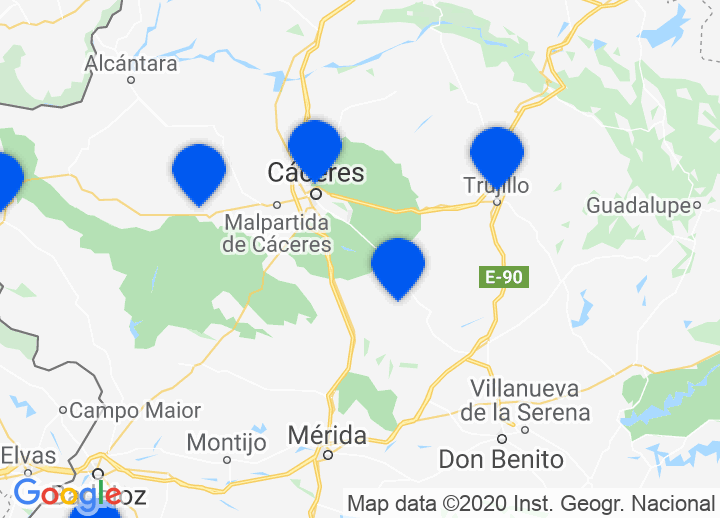 Its major cities are Cáceres, Badajoz, Mérida, Plasencia and Don Benito. None have more than 150,000 inhabitants. Indeed, this is a sparsely populated region with only 24.5 inhabitants per square kilometre. The climate is continental and consists of temperate winters and hot summers. The major activity is agriculture, though there is also an important crafts industry in cork, leather, copper and wood. Choose from our unique selection of authentic hotels and country inns in Extramadura, including beautiful Caceres hotels, Trujillo hotels amongst others. Whatever your taste, we’ll help you find that perfect getaway in Extremadura. Cáceres was declared World Heritage City in 1985. Sober, seigniorial and proud, it lies in the heart of this conquistador homeland and is one of the best medieval and renaissance examples in the world. It is blessed with a labyrinth of medieval streets and plazas, churches, beautiful convents and amazing palaces. Largely medieval, the town walls date from the time of the Almohads and even preserve some Roman sections. Twelve of the thirty towers which once protected the enclosure are still standing. If Spain had anything akin to the American Far West, it must have been Extremadura - the land beyond the River Duero - the area that gave birth to so many doughty Conquistadores. Trujillo, is one of the most attractive towns in Extremedura, much of it untouched since the 16th century. This is the land of Francisco Pizarro, who conquered Peru and Orellana, who discovered the Amazon. Coria is a town surrounded by solid Roman walls, with an interesting castle and pretty cathedral that is approached from the north. It lies on a rich fertile plain amidst tobacco and cotton plantations. Plasencia lies on the banks of the Jerte. This is another town of monumental sights reminiscent of past grandeur, with small picturesque streets, aristocratic palaces, two cathedrals and a hunting museum. The nearby Yuste Monastery cannot be left out on a visit. It was the last home of Emperor Carlos I of Spain and is breathtakingly austere.